A Kickstarter project, just like any other project on the crowd-funding site, hopes to speed up your day by allowing you to keep your phone secure, while also accessing it more quickly when you have security options enabled. With the SALT card, which is in the shape of a credit card, users will no longer need to enter their pin or pass codes while within 10ft. of the card, as the device and card wirelessly sync thanks to Bluetooth technology. 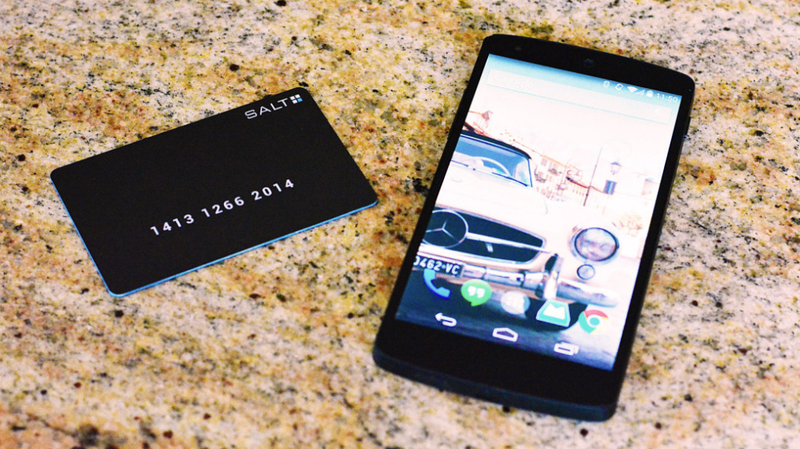 To partner with SALT, an Android app will also be made available, allowing you to locate your wallet or purse via a map should you ever lose them while out on the town. Not only can you locate your lost items with the app, but users can set usage limitations for applications when your card is not near the device. These apps can be selected through the partnered SALT application. In addition, the company states that SALT’s battery life is approximately 1 year, and is easily manageable, given its credit card shape. Interested? Check out the Kickstarter campaign video below, then if you are ready to back the project, follow the link below. Backing amounts start at just $10 for a SALT card. Monday Poll: Interested in the HTC Nexus 9?